The Pennsylvania Treasury Department has launched the Achieving a Better Life Experience (ABLE) Savings Program website, www.paable.gov, that provides quick and easy access to essential information on the upcoming program to give individuals with qualified disabilities a tax-free way to save for future disability-related expenses, while maintaining government benefits. The site also has a short quiz to determine eligibility, a comprehensive Frequently Asked Question section and allows users to sign up to receive updates on the program when accounts open for enrollment. This program was created through Act 17 of 2016, legislation I was proud to co-sponsor and support. It was modeled after the college 529 savings account programs. PA ABLE accounts will allow eligible individuals with qualifying disabilities and their families to save for housing, education, transportation, medical, and other expenses without jeopardizing government benefits. The federal tax-free savings and investment options are offered to encourage individuals with a disability and their families to save private funds to support health, independence, and quality of life. The Treasury Department will update the PA ABLE website regularly with news of account openings, investment options, and account enrollment. Visitors are encouraged to explore the website and sign up for direct emails from the Treasury Department on PA ABLE programming. Treasury staff is also available to answer questions via phone at 1-855-529-2253, Monday – Friday, 8 a.m. – 5 p.m.
On Tuesday, November 15, DJ Stemmler, an administrator at the University of Pittsburgh, along with Georgia Petropoulos, OBID executive director, and Kannu Sahni, Pitt’s director of Community Relations, embraced the opportunity to lead the University of Pittsburgh's Senate community relations committee (CRC) on a half-mile trek through Oakland pointing out what’s good, what’s bad and what’s improving in terms of ADA accessibility. The fight against inequality will take center stage at the Ford Foundation under a sweeping overhaul announced today by the nation’s second biggest philanthropy. Not only will Ford direct all of its money and influence to curbing financial, racial, gender, and other inequities, but it will give lots more money in a way grantees have been clamoring for: It hopes to double the total it gives in the form of unrestricted grants for operating support. 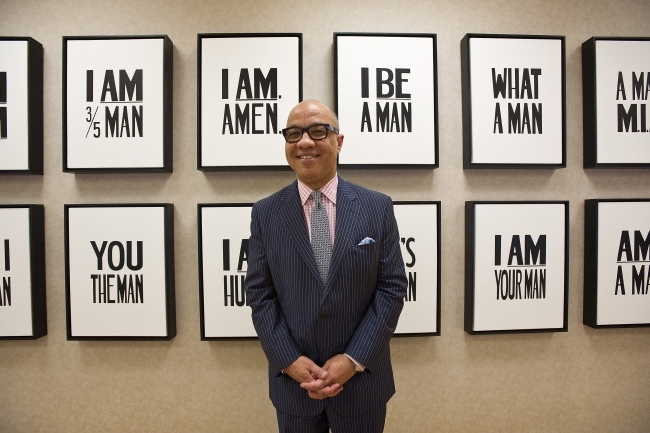 The doubling of general operating support to 40 percent of the foundation’s grant-making budget, projected to be in excess of $1 billion over five years, will enable Ford to create what its president, Darren Walker, calls a "social-justice infrastructure" reminiscent of the support it provided nonprofits during the civil-rights era. "By giving a set of institutions core support or seed capital, we helped initiate and support entire movements," he said. "We contributed to an entire generation of social-justice leaders around the world." pathVu is excited to announce the publication of ASTM E3028-16 titled: Standard Practice for Computing Wheelchair Pathway Roughness Index (WPRI) as Related to Comfort, Passability, and Whole Body Vibrations from Longitudinal Profile Measurements. This is an important outcome from over 20 years of pathway-related research to improve the lives of people with disabilities performed by the founders of pathVu and researchers at the Human Engineering Research Lab at the University of Pittsburgh, with funding from the US Access Board, Veterans Administration, and Industry Sponsorship. Our proprietary Pathway Measurement Tool (PathMeT) was used to develop this standard and has been used to evaluate sidewalk quality around the United States. pathVu will be conducting a series of free webinars describing the new standard, the proposed WPRI thresholds for ADA compliance that have been published in Assistive Technology, and the upcoming policy and legislative steps that will make this a requirement for all pedestrian pathways. Those interested in attending should use the following form to express their interest: pathVu E3028 Webinar Interest. pathVu is excited for the publication of this standard in pursuit of its vision of a world that is accessible, walkable, and safe for all pedestrians -- of all abilities. As part of the on-going efforts to make Oakland a model community for accessibility, OBID, OTMA and the Oakland for All team worked with our City partners to mark the ADA Parking spots with the universally recognized blue color. A special thank you to our City Councilman Dan Gilman (left) and City Chief Operations Officer Guy Costa (right) who led the effort to make Oakland the first Pittsburgh community to have these blue markings. Together, we are opening a pathway for a community without barriers. The Ramp Crawl is a fun, positive event that enables registered participants* with the opportunity to experience many Oakland establishments. For a donation of $20, each ‘crawler’ will receive a Ramp Crawl 2016 t-shirt, and if participants visit each designated ‘stop,’ they’ll walk away with a generous gift bag. Attendees will enjoy beverage specials and food from various Oakland food and beverage establishments. All ticket proceeds benefit the Oakland For All – Beyond Accessible program and its initiatives. 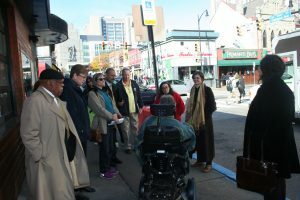 The event showcases best practices of ADA compliant establishments and positions Oakland as a thought leader in creating a more accessibility-friendly business district. *Must be 21 years of age or older to participate in the Ramp Crawl 2016. If you have any questions, Oakland For All – Beyond Accessible also welcomes you to contact Georgia Petropoulos 412.683.6243 ext. 18 or Mavis Rainey 412.687.4505. From May through August 2015, the City of Pittsburgh and Allegheny County celebrated the 25th Anniversary of the Americans with Disabilities Act (ADA) with a series of community-wide events recognizing the landmark law that has transformed lives by removing barriers to civic participation, housing, transportation, employment, arts and recreation, education and much more. This site is brought to you by Oakland Transportation Management Association.